San Miguel de Allende, GTO, MX: Pulling out the Beatles’ quote as my title for a couple of reasons. First, little Wiley is obsessed. He’s discovered the Beatles, and he’s WAY into them. Like, walks around singing “Penny Lane”, and “Strawberry Fields” obsessed. Hours in his bedroom watching Youtube videos of the Beatles obsessed. Tonight I’m at home alone, as he and his dad have gone to watch a Beatles’ tribute act that is playing at one of the local theaters. Early on I averred myself to be strongly “Rolling Stones”, in the great “Rolling Stones vs. Beatles” debate, and so when we became aware of this event, it defined itself as their night together. The second reason is because it is. Getting better all the time. With every passing day, it becomes easier, feels more like home, and we start to fit in. Or at least feel more at home. While I assert that this blog is not a virtual diary of every passing day of our lives, as I hope for it to be more, I will give you a run-down on the latest. Last week I visited the Sociedad Protectora de Animales, or SPA, as its commonly called. I contacted them many months back and told them we were moving here for a year and I’d love to help out. I was pleasantly surprised at the cleanliness of the facility. I met the director, as well as the veterinarian on staff. They have cats as well as dogs, and call themselves a “no-kill” shelter, although there is no generally accepted definition of this term in the world of animal rescue. It turns out to be what each facility can do, and in the case of SPA they keep animals as long as they can make them comfortable without excessive intervention or medical care, and adopt out as many as they can. For example, a diabetic animal would likely be euthanized upon diagnosis, as they just can’t afford to take care of it. I recently completed three and a half years on the board of directors for the Fort Collins Cat Rescue and Spay/Neuter Clinic, and assuredly, their definition of “no-kill” is quite different. From my visit on Tuesday I learned that the budget of the SPA is around $200,000 USD per year. I suspect they are doing amazing things with the resources that they have. We agreed that I would come every Tuesday and help out as I can. Wiley IV attended an art camp last week, and hopefully you saw the amazing masterpiece that was his final project: a portrait of our dog Gizmo. The woman who ran the camp is a native of Vietnam, who emigrated to Canada as a young girl, and eventually moved to Mexico. She uses this camp as a means to fund outreach activities to local villages, to teach the children there how to express themselves through art. It’s always so very cool to meet people who are making a difference in some small way. 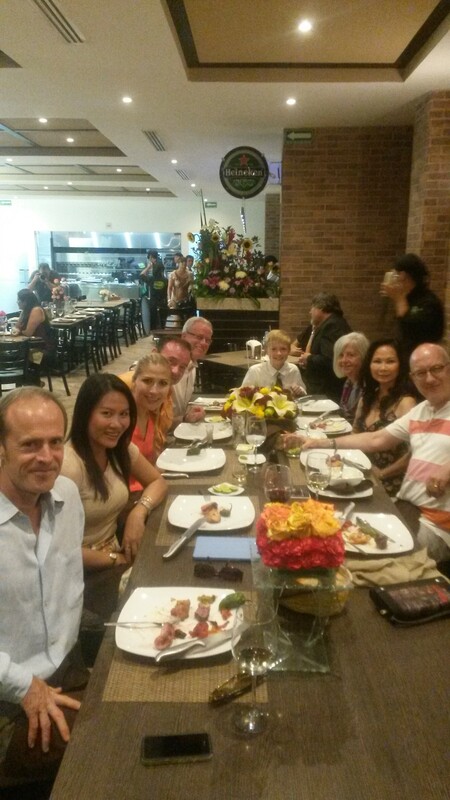 Out of the blue, Hannah (Wiley’s art teacher) invited us to attend the grand opening of a Brazilian restaurant in San Miguel. We weren’t sure what to expect, but since our social calendar was pretty dang open, we accepted. We dressed up, and took a cab to the restaurant. We found Hannah and her group of friends inside, and were quickly made to feel at home, although we later found out that our group was larger than the restaurant had expected. No one seemed to mind, and the food and drink came freely. And Hannah’s friends, Bob and Mary Beth (from the U.S.), Guillermo and Silvia (from Mexico City), and Winifred and Sirina (he a German diplomat stationed in Havana, and she from Thailand) welcomed us with open arms. Really, an amazing group of people, several of whom rearranged their seats so that they could sit and talk to us and get to know us. They extended an invitation to us to watch the World Cup finals the next day with them, and Winifred being German, it was clear that it was a pretty big day. And let me just go ahead and admit: we are completely CLUELESS about soccer, or “football”, as they call it outside of America. I kept asking stupid questions, like “why are they letting that guy kick the ball out of the corner of the field?” and “what happens if NOBODY SCORES A GOAL???”. Ultimately, as we all know by now, it didn’t matter, as Alemania got the win. Let me take a moment to shout out the awesomeness that is Google Translate, the fantastic application which just told me how to say “Germany” in Spanish. Do you know this capability? Have you needed to speak with someone who doesn’t speak English, because let me tell you, it is beyond amazing. Our housekeeper Sandra stayed with Wiley last night while we had Date Night, and I don’t know how we would have had a meaningful conversation without it. Date Night. Do you do this, if you’re married with children? Because I highly recommend it. Hell, I recommend it even if you’re not married, or if you are and you don’t have children. It’s a chance to go out and be adults, and talk about what’s important between the two of you. And let’s be honest: until they substantially lower the drinking age, kids will continue to get bored in bars. Wiley and I went out last night in search of fun and did indeed find it. We visited an excellent mezcalaria, which we have been eyeing since arriving but didn’t really feel comfortable taking the Little Man to. What’s a “mezcalaria”, you ask? Really, they don’t have these in your neighborhood? It’s a bar that specializes in that uniquely Mexican liquor, mezcal, which is somehow related to tequila, only it’s not, and I’m certainly not the person to tell you why. It gained notoriety at some point as the liquor that had the worm in the bottle, but it has grown in prominence and sophistication as of late. I had an incredibly delicious mezcal margarita made with ginger and mint that was TO DIE FOR. We then headed out for parts unknown, wavering on the boundary of is-it-too-early-for-dinner-or-should-we-have-one-more-drink. You’ve all been there. That’s what I love about Date Night: you never know what’s going to happen. In the quest for a bar I had seen the week before, we found ourselves in another place, the lobby of the Sierra Nevada hotel. The expensive-hotel-drinking siren in my head went off, and I was just about to suggest an exit when the very hospitable staff swarmed us and bade us sit, relax, have some peanuts. So we did, and ordered margaritas, using that married people telepathy that we have developed after nearly twenty-five years of sharing toothpaste to telegraph OK, one drink here and then we’re OUT. I had no sooner visited the lovely bathroom with the tiny individual linen hand towels when the lights went out and a ridiculous gutter-choking thunderstorm hit. We were handcuffed in velvet ropes at the Sierra Nevada, serenaded by the guitar and violin combo (who gamely continued to rearrange themselves to avoid the leaks that continued to sprout from the ceiling) and lulled by the sounds of thunder and pounding rain on the rooftop. We ultimately ordered an excellent dinner and wine and spent less than $100, taking a taxi home five blocks because of the continued downpour. 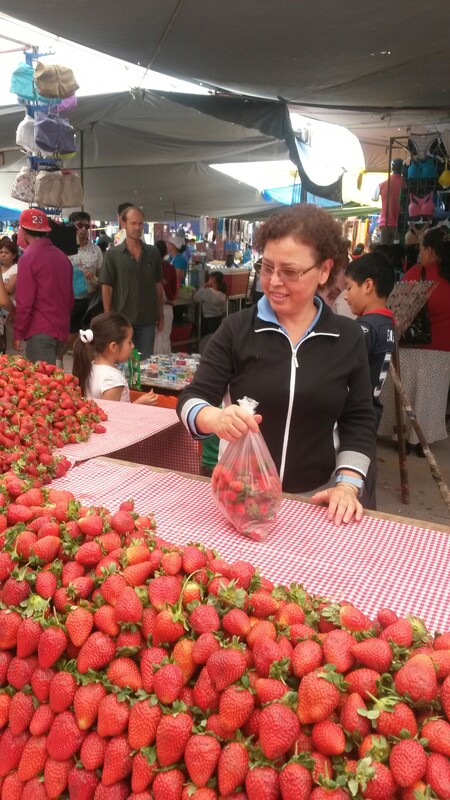 This lady is selling the freshest, most delicious strawberries you can imagine. One kilo (2 pounds) for $2. 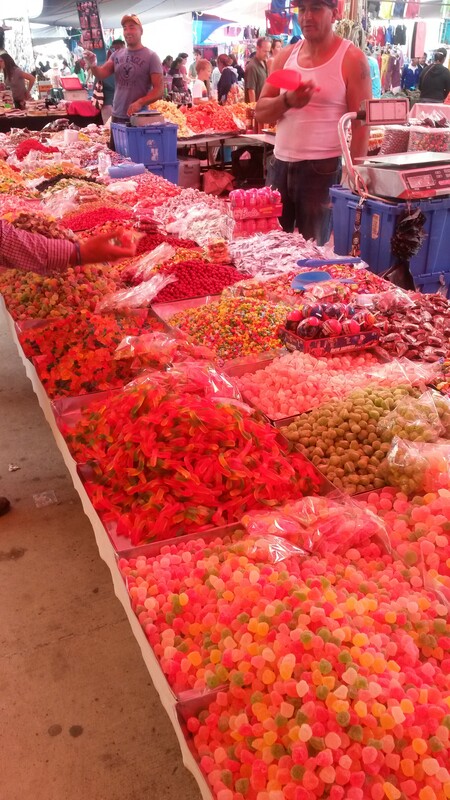 One other event of note to mention was our visit to the Tuesday market. C’mon, guess when it happens!!! Tuesday, that’s right! This place is enormous; estimates of its size put it at three football fields. We had read about it in the guide books, and I’ve certainly been to many local markets around the world, but holy cow, this was something to see. Beverages, snacks, vegetables, fruits, tires, batteries, remote controls, calculators, lady’s underwear, nuts, meats, fish, flowers, machetes, car parts – I can go on and on. If they don’t have it, you don’t need it. Walmart on steroids, without the rednecks in stretch pants. It’s on like Donkey Kong, for us, every Tuesday. I’ll close by telling you that it’s starting to seem like home, although things like church bells and fireworks at 6 AM (no, I’m not kidding) continue to remind us that we’re in a foreign land. Thanks for your lovely comments, and for sharing our adventures with your friends and loved ones. We miss you all, but it’s getting better. All the time. I love hearing all of your adventures…you are going to be FINE with all of the lovely people from ALL over the world there. I am having one of my world-famous margaritas tonight and now I know why, I was telepathically thinking of YOU and the EXPENSIVE hotel bar you were in…nah, I really wanted a margarita on a summer evening and coincidentally, you were talking about them….but it sounded good! Anyway, I’m living vicariously through all of your adventures! Enjoy! Salud! I am very much enjoying the chronicles of your experience. You and the crew seem up for going with the flow which I think comes in handy in MX….heck, any place on the planet. I for one appreciate that MX teaches me that way of being….not easy for me. Very good to hear about IV and his adventures. Funny how kids rediscover the things of our youth as we did before, Tell him I did not miss the tie at dinner…..very impressive….he is going to learn many things and I am thinking most of them aren’t going to be based on school. I did look up Colon/Queretaro and the distance is about 112km….close.